Turning an old t-shirt or dress that no longer fits into an easy t-shirt dress by adding a skirt to a t-shirt. This project is simple and can be made quickly with this diy t-shirt dress tutorial. I choose my favorite fabric to make a skirt and then added the skirt to the t-shirt and had a cute dress! This post has been updated. I was really excited to pull this dress out to go with the pillows I made with the new Derby Day fabric collection. I honestly can’t believe the t-shirt dress still fits one of them (Ava was seriously still a baby in the first pictures. The baby chub is killin’ me). I am leaving the older pictures up as well because I simply adore the blue dress but sadly it was lost along the way. I updated the tutorial graphics but am leaving the rest of the post as it originally was because it is still one of my favorites! I am so so excited, the Kentucky Derby will be happening again soon! If you’re wondering why this makes me so excited let me explain. I was born in Lexington, Kentucky, spent 8 years there during my 20’s and believe it or not…my dad was a jockey! Yes, for real. In fact, my family has and still does racehorses in Lexington. Even while growing up in California my entire childhood was spent around horses. I guess you could say I have never known a life without horses. So when Melissa Mortenson of The Polka Chair (whose style I simply adore) came out with her horse-centric fabric line Derby Style I just about flipped. I knew I HAD to do something awesome with these prints, so I decided that the diy t-shirt dress tutorial was the perfect project. For more inspiration from this line, check out the horseshoe-shaped pillow I made! Super fun!!!! You can also see the Modern Hourglass Pillow made with Derby Day fabrics. The Derby Style line is sold out but the new Derby Day line just came out and has so many cute prints, including my favorite horse print. My best friend Jennie sent me the horse print fabric because she knows my true heart. Yay for best sewing friends! 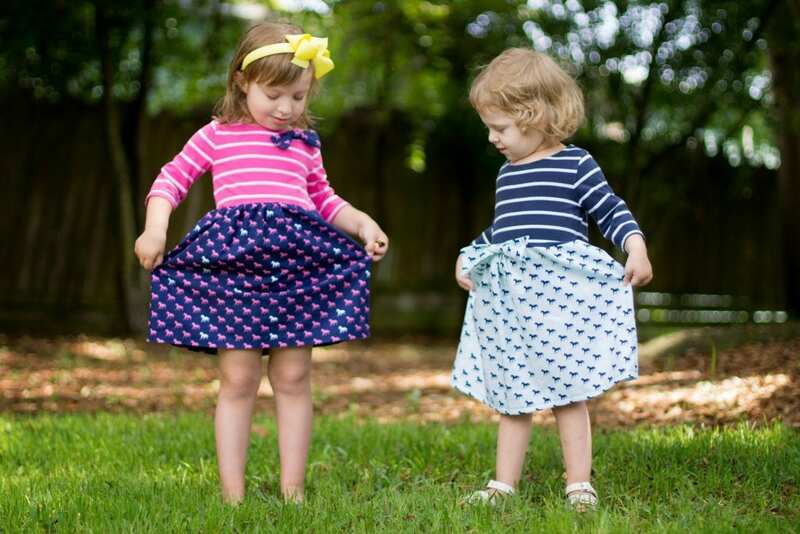 I happened to have two boat neck style dresses that were getting very short on my girls and when I saw how well they went with this fabric I knew it was a perfect match. To make the easy t-shirt dress simply pick a coordination old t-shirt and your favorite fabric. You will make a skirt and sew it to the shirt to make a diy t-shirt dress! So I have a super easy and fun T-shirt dress Pattern and Tutorial with two bow options. I was able to use a 1/2 yard for each toddler t-shirt dress. For the shorter dress (3T) I had a little more fabric and made a larger bow and for the longer dress (5T) I made a smaller bow and attached it to the collar. For sizes 6 and up you will probably need a whole yard for the correct width. Using either a t-shirt or a dress that is too short determine where you would like to cut the t-shirt. I generally use the belly button as a reference point at which to cut. Add a half inch for the seam allowance. Measure either a skirt or from the belly button to where you would like the dress length to end. I usually measure just below the knees. Add a half inch to both sides and the top for seam allowance. For the bottom add a full inch so you can hem it. Mark and cut. Using a 1/2″ seam join both sides of skirt pieces right sides together, pin and straight stitch down the short sides. Fold bottom raw edge under 1/4″ and press. Fold bottom edge under another 3/4″ and iron. Sew hem 1/2″ from the bottom edge. To gather skirt lengthen your stitch to 4 or 5 and straight stitch 1/4″ from the raw edge. Repeat this step sewing a second line 1/2″ from the raw edge. Pull thread ends to gather skirt to match the width of the t-shirt opening. Pin shirt and skirt waist together. Sew together using a 1/2” seam, serge or zigzag stitch edges to prevent fraying. Cut 2 rectangles 5 x 7 inches. Starting near one corner sew 1/4” around edges leaving a 1 1/2 inch opening. Turn rectangle right side out pushing corners square and slipstitch the opening shut. Repeat these steps with a smaller rectangle as well. Push the center of bow together, you can sew this together if you like. Using smaller rectangle, place on the front of the bow and wrap around until both ends meet. Hand sew the small rectangle edges together on the backside of the bow. When finished hand sew and attach to dress in the desired place. 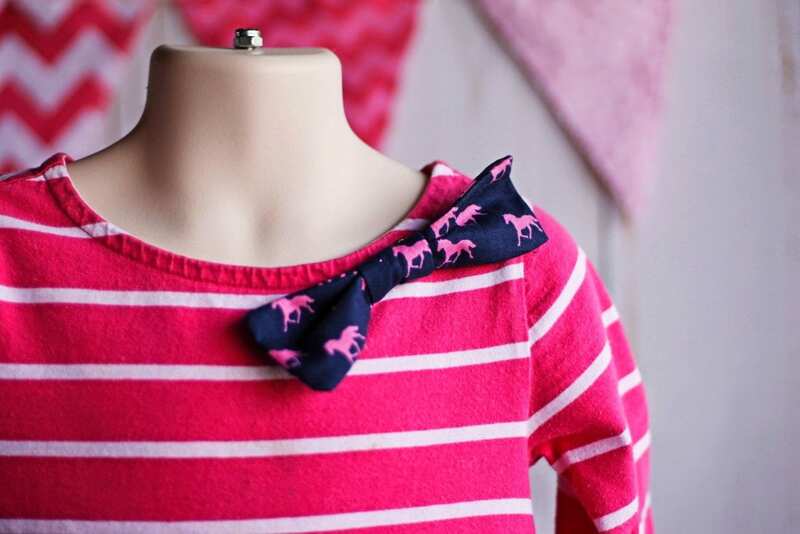 Download the Fabric Bow Sewing Pattern. This will give you the correct measurements for the bow. If you don’t have a t-shirt to upcycle my picks for a pattern would be the Bateau Neck Top from Aesthetic Nest. And a few striped knits from Riley Blake Designs that would work the Derby Day cotton prints. Hope you have a great Derby Day! What very cute dresses. I can’t get over how awesome the bow at the waist is! Very cute! I’ll have to keep this in mind for once my girl is out of onesies! Such a great idea to up-cycle old tshirts! Really love the Derby Horse fabrics too! Instead of hand or machine gathering, we use 1/4 or 1/2 inch wide elastic cut to width of the t-shirt. Sew the elastic to the skirt, then sew the gathered skirt to the t-shirt top. This allows the dress to “give” at the waist. This is very useful when making dresses for charity, when you need to accommodate various sizes.